Zalagh Kasbah Hotel & Spa enjoys a fabulous location near Agdal gardens, from where guests can enjoy magnificent views of the Atlas Mountains. The balmy weather allows guests to have ultimate fun with a range of recreational activities available for people of all ages in the family. The bungalows in the hotel are bright and charming. They come in different categories to accommodate couples, families and group of friends. There is a lovely outdoor swimming pool and a spa, where you and yours can spend time relaxing. Whatever is your food and drink choice, you will find a full menu of dishes to delight you from morning to night in the onsite restaurant, bar and café. 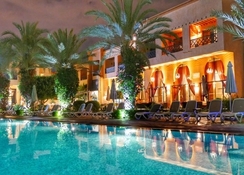 Zalagh Kasbah Hotel & Spa is nestled near the Agdal gardens and Medina city. There are several places of interest, clubs and of course the Atlas Mountains are close to the hotel. The Menara Airport is just 5.4km from the hotel, making it convenient for the guests to board their flights on time. The 220 rooms, that also comprise seven duplex and 17 suites, are airy and luxurious. They are strategically designed to accommodate singles, couples, families and group of friends. They have all the necessary amenities to satisfy the expectations of the modern day traveller. Amenities and facilities of the rooms include independent air conditioning, plasma screen TV, Wi-Fi, safety deposit box, telephone, mini bar and hair dryer. The onsite restaurants serve a variety of local and international cuisines. The establishment features a buffet restaurant, a sky bar and a lounge roof bar. The buffet restaurant serves appetising breakfast, lunch and dinner. 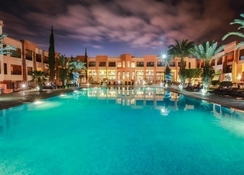 There are plenty of sport, entertainment and fun activities at the Zalagh Kasbah Hotel & Spa. There is an outdoor swimming pool where you can take a refreshing swim under the sun. You will also find sun loungers around the pool, where you can sit-back, relax and have refreshing drinks. Hit the spa to relax and rejuvenate yourself with some fantastic massages and beauty treatments from expert masseurs. Guests will be surprised to see shopping opportunities within the hotel. Luxury Stay & Stunning Facilities! We stayed here for 7 days in July 2018. It was a beautiful hotel & the grounds were stunning. There was so much food for the all inclusive & got to try some traditional Moroccan food. We even lounged on the sunlounge tiki guys & the pool was lovely. There was a quieter pool and loud one playing music and both were a perfect mix! Lovely place! The hotel was very close to the airport, about 10 mins drive. Has a small shopping centre near the hotel about 10mins walk, where they have KFC ect. Which was very convinient. It was a little further from the actual market but not too bad. The hotel was clean and tidy. Rooms would be tidied up everyday. One of the downside to the hotel was the fact that when you arrive and sign they ask you to pay a charge, so me and my husband both huggled. Which they seemed to accept. Another downside is one of the evening it was quite late around 2am or something, a family had arrived and there were problems going on. They customer as well as the receptionist were shouting at one another, which isnt professional at all, also at the time of the night and in front of majority of the customer that came to stay at Zalagh Kashba hotel. Rooms were not arranged beforehand so had to wait a while to get that sorted. Had to keep requesting for towels and clean bed sheets.